Inuit women are highly exposed through their traditional seafood based diet to organochlorine compounds, some of them displaying endocrine disrupting properties. We hypothesized that this exposure might be related to bone characteristics that are altered in osteoporosis, because hormone deficiency is a known risk factor for the disease. We measured quantitative ultrasound parameters (QUS) at the right calcaneum of 153 peri- and postmenopausal Inuit women (49–64 year old) from Nuuk, Greenland, and investigated the relation between these parameters and plasma organochlorine concentrations. We used high-resolution gas chromatography with electron capture detection to analyze plasma samples for 14 polychlorinated biphenyls (PCB) congeners and 11 chlorinated pesticides and metabolites. We analysed morning urine samples for cadmium, a potential confounder, by atomic absorption spectrometry. We used a validated questionnaire to document dietary and lifestyle habits as well as reproductive and medical histories. Concentrations of PCB 153, a surrogate of exposure to most organochlorines present in plasma samples, were inversely correlated to QUS parameters in univariate analyses (p < 0.001). However, PCB 153 concentrations were not associated with QUS values in multivariate analyses that comprised potential confounding factors such as age, body weight, former oral contraceptive use and current hormone replacement therapy (HRT) use, which were all significant predictors of bone stiffness (total R2 = 0.39; p < 0.001). Overall we found little evidence that organochlorines exposure is related to osteoporosis in Greenlandic Inuit women, but the hypothesis that exposure to dioxin-like compounds might be linked to decreased bone quality and osteoporosis deserves further attention. Osteoporosis is commonly defined as a decrease in bone mineral density (BMD) and the microarchitectural deterioration of bone tissue . It is a multifactorial chronic disease that may progress silently for decades until characteristic fractures occur late in life. This bone fragility increases considerably the risk of osteoporotic fractures, such as those of the distal radius, humerus, spine and hip that often appear in older women following a minimal trauma. Hip fractures lead to rehabilitation problems and greatly decrease the quality of life [2, 3]. Risk factors for osteoporosis in women include advanced age, small body size, cigarette smoking, hormone deficiency, genetics, low physical activity, low intake of calcium and vitamin D, menopausal status, the use of certain drugs (eg, glucocorticoids) as well as several medical disorders [4, 5]. Exposure to environmental chemicals that are able to disrupt the hormonal equilibrium might represent another risk factor for this disease . More specifically, in view of the important role of estrogen deficiency in the osteoporotic process , compounds that can interact with estrogen receptors or alter estrogen metabolism could be involved in the pathogenesis. Certain environmental chemicals that are part of the organochlorine (OC) family, a group of persistent and bioaccumulative chemicals that have been used extensively in agriculture and various industrial applications between 1930 and 1980, can modulate the estrogen signalling pathway, namely polychlorinated biphenyls , β-hexachlorocyclohexane  and 2,3,7,8-tetrachlorodibenzo-p-dioxin and structurally-related compounds [10–12]. Results from two recent studies suggest a possible relation between osteoporosis and exposure to OCs [13, 14]. High concentrations of OCs have been found in plasma samples from adult Greenlanders compared to those reported for southern Canada and European populations [15, 16]. OCs are transported from industrialized areas of the planet to the Arctic by ocean and air currents [17–19], where they condensate and are biomagnified in predator species located at the top of the marine food chain, such as predator fish and sea mammals [17, 18, 20]. The traditional Inuit diet comprises large amounts of sea mammal and is the major source of OC exposure in this population [17, 18, 20–22]. In view of the unusually high exposure to OCs in Greenland, we set out to examine the associations between OCs plasma concentrations and ultrasound bone measurements among peri- and postmenopausal Greenlandic Inuit women. QUS parameters have been shown to be strongly associated with future fracture risk [23, 24]. We also measured the concentration of cadmium in urine because low-level cadmium exposure has been linked to osteoporosis [25, 26] and therefore it represents a possible confounding factor. This descriptive cross sectional study was conducted during September 2000 in Nuuk, Greenland, home to a total population of approximately 14,000 inhabitants. To be eligible, women had to be born in Greenland and aged between 49 and 64 years. A random sample of 200 women was taken from the Greenland statistics list comprising 547 eligible women. Of the 200 women, 7 had died, 11 had moved to another town and 15 were out of town at the time of the study (not for medical reasons). Thus, 167 women were invited to participate to the study; eight declined, for a participation rate of 95%. Six women were excluded because of illnesses (human immunodeficiency virus, mental disorder and flu) and therefore 153 women completed the study. After obtaining information on the study and signing an informed consent, participants completed a detailed and validated Danish questionnaire with the assistance of a qualified interviewer during a face-to-face interview. The questionnaire was adapted from the Mediterranean Osteoporosis Study Questionnaire (MEDOS)  and allowed to document the following risk factors for osteoporosis: smoking habits, physical activity, daily milk products and calcium supplement consumption, current use of HRT and former contraceptive use. Questions were also asked to document secondary causes of osteoporosis such as Cushing's disease, renal and liver deficiency, hyper- and hypothyroidism, bone cancer and rheumatoid arthritis. Weight, height and waist, abdominal and hip girth were measured using standardized techniques. Women were considered postmenopausal if they had no menses for at least one year before the recruitment, if they underwent bilateral oophorectomy more than 6 months ago and if analysis had revealed a follicle stimulating hormone concentration greater than 40 IU/L. Blood samples (10 ml) were collected in vials containing EDTA as the anticoagulant, centrifuged (10 min, 3000 rpm) and the plasma poured into glass vials pre-rinsed with hexane. First morning urine samples were collected in plastic vials. Plasma and urine samples were stored frozen at -80°C until time of analysis for OCs and cadmium respectively, at the Centre de Toxicologie (CTQ) of the Institut National de Santé Publique du Québec (Québec, Canada). This laboratory is accredited by the Canadian Association for Environmental Analytical Laboratories. Fourteen PCB congeners [International Union for Pure and Applied Chemistry (IUPAC) no. 28, 52, 99, 101, 105, 118, 128, 138, 153, 156, 170, 180, 183, 187], p, p'-DDT (dichlorodiphenyltrichloroethane) and its major metabolite p, p'-DDE (p, p'-dichlorodiphenyl-dichloroethylene), hexachlorobenzene (HCB) and 8 other chlorinated pesticides [α-chlordane, γ-chlordane, aldrin, β-hexachlorocyclohexane (β-HCH), mirex, oxychlordane, cis-nonachlor, and trans-nonachlor] were analysed by high-resolution gas chromatography with electron capture detection. A 1:1:3 mixture of ammonium sulfate:ethanol:hexane was first added to the plasma to extract OCs. The extracts were then concentrated and purified on two Florosil columns (60–100 mesh; Fisher Scientific, Nepean, Ontario, Canada). The OCs were measured in the purified extracts with an HP 5890 high-resolution gas chromatograph equipped with dual-capillary columns (HP Ultra I and Ultra II) and dual Ni-63 electron capture detectors (Hewlett-Packard, Palo Alto, CA, USA). The limit of detection was based on 3 times the average standard deviation of noise and was 0.08 μg/L for p, p'-DDE, p, p'-DDT and β-HCH, and 0.04 μg/L for all other compounds. The average percent recoveries were greater than 95%. Coefficients of variations (CVs) based on repeated analyses of a standard reference material (SRM 1589; N = 15) ranged from 3.9% to 18.5%, except for PCB 105 and p, p'-DDT, for which CVs were 31.6% and 26.2%, respectively. Plasma OC concentrations were expressed on a lipid basis. We calculated the total plasma lipid concentration from the concentrations of cholesterol esters, free cholesterol, triglycerides and phospholipids , which were measured using standard enzymatic procedures. Urine samples were analysed for cadmium by graphite furnace atomic absorption spectrometry and concentrations were corrected for urinary creatinine content to take into account differences in urinary output between participants. Duplicates were run every 10 samples. The CV of the method based on repeated analyses of a standard reference material from CTQ interlaboratory comparison program (N = 34) was 2.0%, and the limit of detection was 0.2 μg/L. QUS bone measurements were performed at the right calcaneum using the Achilles™ ultrasound bone densitometer (Lunar Corporation, Madison, WI, USA). This technique is fast (approximately 3 minutes), simple, non invasive, safe (radiation-free), inexpensive and portable. The heel is immersed in water and an ultrasonic pulse propagates through the bone. Three QUS parameters were measured: 1) broadband ultrasound attenuation (BUA, dB/MHz), which reflects bone density as well as its architecture; 2) speed of sound (SOS, m/sec), which reflects bone density and elasticity; and 3) bone stiffness index (SI, %), which reflects the rigidity of the bone structure. SI was computed from BUA and SOS measurements using the manufacturer's equation and expressed as a percentage of young adults' average peak SI. The densitometer was calibrated daily using the acoustic phantom provided by the manufacturer and showed no drift. In vivo precision was evaluated by repeated measurements conducted among 15 subjects: CVs were 0.8% for BUA, 0.2% for SOS and 1.1% for SI. Because distribution of values for organochlorine concentrations in plasma lipids and urinary cadmium concentrations were skewed right, they were log-transformed and the geometric mean was used as the measure of central tendency. A concentration equal to half of the detection limit was given for samples with levels below the detection limit. Means of bone measurements were compared for dichotomous risk factors using Student's t tests. We used Pearson's correlation coefficients to assess correlations between QUS measurements and continuous risk factors. PCB 153 was used as a surrogate of the organochlorine mixture present in the traditional diet because concentrations of this congener in plasma were strongly correlated to those of most other OCs. Nevertheless, since β-HCH, p, p'-DDE and HCB were not as strongly correlated to PCB 153 (Pearson's r = 0.75–0.78), statistical analyses were also performed with these variables. In order to verify the association between bone measurements and concentrations of OCs, multivariate regression analyses were performed. We evaluated the confounding effect of osteoporosis risk factors on the relation between OCs and QUS parameters and retained only factors associated with bone measurements (p ≤ 0.10) in the regression models. Statistical significance was set at α = 0.05. Multiple linear regression assumptions regarding the homogeneity of variance and the normality of residues were met when log-transformed OC concentrations were entered in the models. Statistical analyses were performed using SAS Statistical program version 8.0 (SAS Institute Inc., Cary, NC, USA). Our study population consisted of 153 Inuit women, mostly postmenopausal whose age ranged between 49 and 64 years (Table 1). Approximately half of the women had a body mass index (BMI) exceeding 27 kg/m2. Most were sedentary, smoked cigarettes, and were not taking calcium supplement or HRT at the time of the study. A majority of women also never used contraceptives. Mean (geometric) urinary cadmium concentration was 1.4 μg/g creatinine (95%-confidence interval = 1.3–1.6), with values ranging from 0.2 to 7.6 μg/g creatinine (N = 141). *Active: at least one period of physical activity (20–30 min duration) per week over the last three months; sedentary: less than one period of physical activity per week. Concentrations of the 25 OCs measured in plasma samples from the 153 participating women are shown in Table 2. Data are provided only for compounds for which 70% of the samples contained concentrations above the detection limit of the analytical method. The geometric mean concentration of the sum of 14 PCB congeners (ΣPCBs) was 2051 μg/kg. The most prominent congeners were PCB 153, PCB 138 and PCB 180. These three di-ortho substituted congeners represented 66% of ΣPCBs. Three mono-ortho substituted congeners – PCB 105, PCB 118 and PCB 156 – were detected in almost all samples and represented 11% of ΣPCBs. p, p'-DDE, the main DDT metabolite, was the chlorinated pesticide with the highest plasma concentration (mean concentration above 1000 μg/Kg), followed by trans-nonachlor, hexachlorobenzene, and oxychlordane, with mean concentrations between 200 and 400 μg/Kg. Frequency distributions for QUS parameters measured at the right calcaneum of the 153 women are shown in Figure 1. 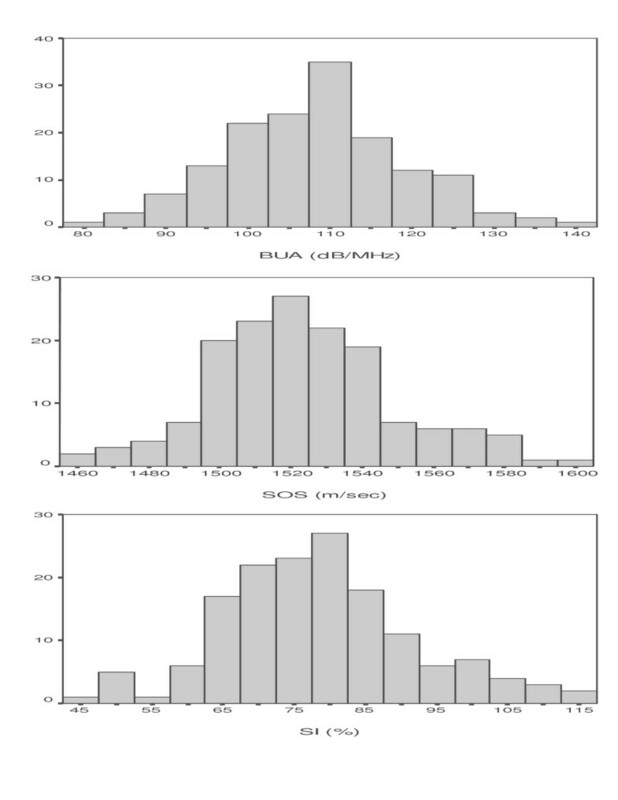 Mean values for BUA, SOS, and SI were respectively 108 dB/MHz (Standard deviation (SD) = 11; range = 68–140), 1523 m/sec, (SD = 26; range = 1463–1595) and 79% (SD = 14; range = 47–117). Frequency distributions of right calcaneal QUS bone measurements in 153 peri- and postmenopausal Inuit women. We first tested relations between QUS parameters and selected dichotomous risk factors for osteoporosis and noted that postmenopausal women, women who were not currently using HRT and those who never used contraceptives had significantly lower values of all three QUS parameters compared to their respective counterparts (Table 3). The level of physical activity was marginally linked to BUA, SOS and SI values. Smoking and taking calcium supplements only influenced BUA values, while the consumption of dairy products had no statistically-significant influence on QUS measurements. Correlation analyses revealed that age was negatively correlated to all three QUS parameters (Pearson's r ranging from -0.31 to -0.42; p < 0.001). All anthropometric measurements were positively correlated to QUS measurements but the strongest correlations were observed for weight (r = 0.33 – 0.50; p < 0.001) and height (r = 0.41 – 0.46; p < 0.001). Urinary cadmium concentrations were negatively correlated to QUS parameters (r varying from -0.23 to -0.29; p < 0.005). Correlations coefficients between QUS parameters and concentrations of selected organochlorines in plasma are listed in Table 4. Concentrations of PCB 153 (log-transformed) were negatively correlated to BUA, SOS and SI measurements (p < 0.001). We also tested correlations between QUS parameters and other OCs that were not strongly correlated to PCB 153 levels. Hexachlorobenzene concentrations were correlated with the three QUS parameters, but not those of p, p'-DDE and β-HCH. Results of multiple linear regression analyses are presented in Table 5. PCB 153 was not associated with QUS parameters in models that included potential confounding factors, although associations were nearly significant in SOS and BUA models (p = 0.072). The significant independent predictors of QUS measurements were age, weight, current HRT use and former oral contraceptives use. These variables accounted for 38%, 34% and 39% of the variance in BUA, SOS and SI values respectively (p < 0.001). Urinary Cd concentration was not retained in the final regression models as it was not associated with any of the bone measurements (p > 0.7). HCB concentrations were also not associated with QUS parameters in multivariate analyses (data not shown). Additional exploratory analyses were conducted with concentrations of mono-ortho substituted PCB congeners, even though concentrations of these congeners were highly correlated to those of PCB 153 (Pearson's r ≥ 0.90). In similar models (data not shown), statistically significant associations were noted between PCB 156 concentrations and BUA (β = -8.12; standard error (SE) = 3.65; p = 0.028), SOS (β = -22.68; SE = 9.07; p = 0.014) and SI values (β = -11.95; SE = 4.53; p = 0.009). Concentrations of PCB 105 and PCB 118 were not associated with QUS parameters in multivariate models. This cross-sectional study was designed to investigate the association between exposure to OCs and osteoporosis-related ultrasound bone measurements in peri- and postmenopausal Inuit women from Greenland. Exposure of the Greenlandic Inuit population to OCs is high compared to North American and European populations  and we hypothesized that exposure to these compounds might favor the osteoporotic process. We found no statistically-significant association between QUS parameters and concentrations of PCB 153, a surrogate for exposure to the majority of OCs present in plasma samples of participants. Some studies have investigated the relation between biomarkers of OC exposure and the risk of fractures in women. Alveblom et al. compared fracture risks between fishermen and their wives from the Swedish east coast on the Baltic Sea (exposed to OCs through fatty fish consumption) and west coasts (unexposed). The authors retrieved information on vital status and hospitalization of 17,823 persons from 1987 to 1996, among which 671 had been hospitalized due to osteoporotic fractures. Poisson regression models taking age and calendar year into account revealed a significantly increased incidence rate ratio (IRR: 2.29, 95% confidence intervals (CI): 1.23–4.28) for vertebral fractures among east-coast women. The authors could not exclude that confounding from differences in smoking habits between the populations might explain part of the observed effects. Wallin et al  conducted a questionnaire study to further assess the impact of consuming OC-contaminated fish on the self-reported fracture incidence in fishermen and their wives from Swedish east and west coasts. Hip, vertebral, and wrist fractures were classified as osteoporotic. No differences in fracture incidence were observed between the east-coast (exposed) and west-coast (unexposed) cohorts. East-coast wives with more than one meal of fatty fish from the Baltic Sea per month had, however, an increased fracture incidence as compared with that of the east-coast wives who ate, at most, one such a meal per month (age-adjusted IRR = 1.68, 95% CI = 1.00–2.84). In both of these studies, OC exposure was indirectly assessed through fish consumption, which might have introduced misclassification of exposure. Few studies investigated relations between OC exposure and bone mineral density measurements. No association was found between plasma p, p'-DDE concentrations and BMD measured at the lumbar spine and radius in 103 peri- and postmenopausal American women (mean age = 54.5 years) who had participated in the Mount Sinai Medical Center Longitudinal Normative Bone Density Study from 1984 to 1987 . Beard et al. examined the relationship between serum p, p'-DDE concentrations and bone mineral density in 68 Australian sedentary women aged 45 to 64 years old. The authors observed that p, p'-DDE levels (mean serum concentration = 3.9 ppb) were negatively correlated to BMD (r = -0.27, p = 0.03). The strongest multivariate model explained 21% of bone mineral density variation (p = 0.002) and comprised log-transformed p, p'-DDE concentrations (p = 0.018), age (p = 0.002), and years of HRT use (p = 0.10) as predictor variables. Finally, Wallin et al. recruited 184 wives of fishermen from the east coast of Sweden (median age 62 years) to participate in an examination of their forearm BMD, using dual energy x-ray absorptiometry (DXA). Univariate analyses showed significant negative associations between BMD and PCB 153 or p, p'-DDE concentrations, but after adjustment for age and body mass index, these associations did not remain, similarly to what was observed in the present study. Additional exploratory analyses in our study revealed significant associations between QUS bone measurements and PCB 156 concentrations, a congener with dioxin-like properties. Animal studies have shown that dioxin-like OCs may impair normal bone metabolism and result in increased bone fragility [32–34]. PCB 126, a non-ortho coplanar PCB congener, impaired the mineralization process of tibiae in rats  and also reduced the collagen content and serum osteocalcin concentrations, resulting in impaired maximum torque and stiffness of the rat humerus . Although biologically plausible, the association noted between PCB 156 and QUS parameters may be due to chance and needs to be replicated in another study in which all dioxin-like OCs would be measured and taken into consideration in statistical analyses. Data on bone measurements and osteoporosis risk factors obtained in the 153 Inuit women can be compared to those gathered from 2972 southern Quebec women of the same age group (mean = 55.8 years, ranging form 49–64 years old) who were recruited during the same period by our research group (unpublished data). The same questionnaires and ultrasound apparatus were used for data collection in both settings. The mean ± SD for BUA in southern Quebec women was 112 ± 9 dB/MHz, 1545 ± 29 m/sec for SOS and 87 ± 13% for SI. Mean values for BUA, SOS and SI in Inuit women from Greenland are respectively 4%, 1.4% and 9.5% lower that those measured in southern Quebec women. A larger proportion of Inuit women smoked (74.5% vs 14.5%) and was sedentary (73.9% vs 24.7%), while a smaller proportion of Inuit women was taking calcium supplements (8.5% vs 46.7%) and HRT (8.5% vs 51.9%) compared to southern Quebec women. Furthermore, mean weight (68.0 vs 66.4 kg) and BMI (27.9 vs 26.5 kg/m2) were slightly higher in Greenlandic Inuit women than in southern Quebec women. These differences in osteoporosis risk factors might explain the lower values for QUS measurements obtained in Greenlandic Inuit women compared to women from southern Quebec. Other studies conducted in Alaska have shown that Inuit women are at risk for osteoporosis. A study conducted in the 70's using direct photon absorptiometry revealed that Alaskan Inuit women had an earlier onset and greater intensity of bone loss beginning in the forties, around menopause, compared to Caucasian women in the US. Alaskan Inuit women lost on average 5% more bone mass per decade than Caucasian American women [35, 36]. Martin et al. reported that the bone mineral content of Inuit women decreased by 50% between the third and sixth decades. More recently, Filner et al. evaluated the prevalence of risk factors for osteoporosis in women from 13 geographic areas in Alaska and noted that low bone density (defined as a T-score of -1.0 or less) measured at the calcaneum by ultrasonography was more prevalent in Native than non-Native women (45.3% in Native vs 22.1% in non-Native, p < 0.001). These authors concluded that increasing calcium intake and decreasing the prevalence of smoking would likely reduce the prevalence of osteoporosis in Native women. A limitation of our study is its cross-sectional design, which can lead to an underestimation of the true association because some subjects might not have been available at the time of ascertainment. Moreover, the exposure is measured at the same time as the health condition of the subject, which makes it difficult to correctly establish a causal relation. Also, our assessment of the physical activity was based on a single question, which documented how many times per week during the last three months had the woman practiced a physical activity for at least 20 to 30 minutes. This question which was validated in a group of workers from southern Canada  might have introduced some information bias. Finally, our study relied on QUS measurements at the right calcaneum to assess bone properties instead of the gold-standard vertebral BMD measurements. Several studies have however shown that QUS measurements are good predictors of the bone density and quality that are related to the risk of osteoporosis [24, 40–43] and to the risk of fracture in early postmenopausal women [41, 43]. In summary, we observed that plasma OC concentrations were not associated with QUS parameters in multivariate models adjusted for age, body size and hormone intake. Exploratory analyses indicated that PCB 156, a congener with limited dioxin-like activity, might be related to bone measurements in this population, but this hypothesis clearly needs to be tested in another setting. We are currently studying the relation between OC exposure and QUS measurements in Inuit women from Nunavik (Arctic Quebec, Canada). In this study, the concentration of all dioxin-like compounds in plasma of participants will be measured by the dioxin-receptor chemical-activated luciferase expression (DR-CALUX) assay. Women will be followed prospectively in order to accurately define the onset and the rate of bone loss. In the meantime, actions should be taken to reduce the prevalence of smoking in Greenlandic Inuit women, which is a known risk factor of osteoporosis. In addition, dietary supplementation with calcium and vitamin D  might also be warranted in this population. We would like to thank the Inuit women of Nuuk who participated to this research project and the medical and health care professionals from the Center of Primary Health Care Queen's Ingrid Hospital for their assistance in collecting data. Specials thanks are extended to Mikael Skytte who contributed as interpreter during the field work, and to Jean-Philippe Weber and Alain Leblanc of the Centre de Toxicologie of the Institut National de Santé Publique du Québec (INSPQ, Québec, Canada) for supervising the analytical chemistry work. We also thank Carole Blanchet and Rabia Louchini (INSPQ) for reviewing the manuscript. This study was funded by the Commission for Scientific Research in Greenland and by Helsefonden from Denmark. SC participated in the design of the study, acquisition of data, interpretation of the data, and drafted the manuscript. PA participated in the interpretation of the statistical analysis, helped to draft the manuscript and revised it critically. SD conceived of the study, and helped to draft the manuscript. CB participated in the design of the study, acquisition of data, and helped to draft the manuscript. GM conceived of the study, participated in its design and coordination and helped to draft the manuscript. HSP conceived of the study, participated in its design and coordination and helped to draft the manuscript. SG performed the statistical analysis and helped to draft the manuscript. ED conceived of the study, helped to draft the manuscript, and revised it critically.